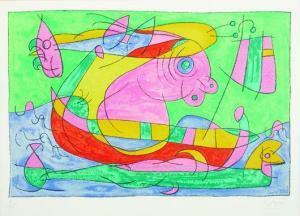 Find artworks, auction results, sale prices and pictures of Ubu Roi at auctions worldwide. Lithograph in colors, on wove paper, with full margins, I. 16 x 24 3/8 in. (40.6 x 61.9 cm); S. 21 x 29 3/8 in. (53.3 x 74.6 cm) signed and numbered 7/75 in pencil (there was also an edition of 205 with smaller margins), published by Tériade, Paris, a small abrasion at the upper center margin (measuring less than 1/8 in. ), the palest mat staining, otherwise in very good condition, framed.